For those of you (most of you) not familiar with my reading binges, I've recently come off one that involved my reading every single mystery written by that fabulous Grande Dame of Mystery, Ngaio Marsh. I've moved on by a few weeks from the last Marsh, but I realized I hadn't written about it on my blog. (Probably because the blog was begun between then and now.) This happens to me occasionally, the binges, I mean. Usually it's just a craving for comfort reading or I'm sunk so deep in a bout of melancholy that only a well-loved book will draw me back. Whatever. I don't, usually stop to analyze, just start looking through my bookcases or head to the library, almost on automatic pilot. There are certain writers who signal a more appealing place and time than whatever happens to be happening in my own life at the moment, so off I'll go in search of them. Or sometimes, it's just a need to reacquaint myself with old favorites for no other reason than I miss their company. Hence my rereading of all of Rex Stout's Nero Wolfe books every few years. And my rereading of Agatha Christie, Josephine Tey and Elizabeth Peters, among others. 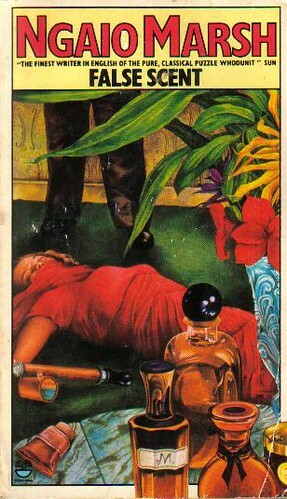 A funny thing happened while I was reading the Ngaio Marsh books though. I suddenly realized that I hadn't, for whatever reason, originally read ALL of them (though I thought I had). What an omission on my part! So, of course, I set about rectifying the situation immediately. 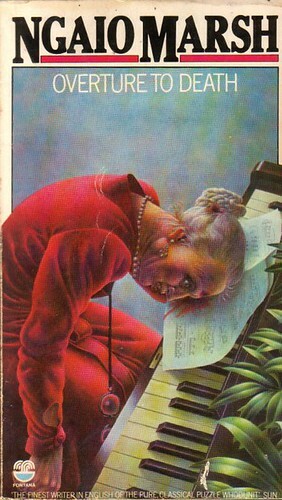 Marsh began writing in the early 1930's and published a book in the year of her death, in 1982. So there is plenty enough to read. It was interesting too, to see how her writing evolved over the years - her use and choice of certain words, for instance. She had a penchant, during the middle years of her writing to use the word 'ejaculate' for every utterance one of her characters made in the excitement of the moment. A stronger word than just 'said' I suppose, but kind of tiresome after awhile, if not often a bit startling. My only complaint involving her writing skills by the way. I wonder if I would have noticed at all if I had not been reading the books back to back. The funny thing is that she outgrew that particular idiosyncrasy in the later books and went back to the use of 'said' as all good writers do. Marsh was born in New Zealand in 1899, and several of her books are set there, though mostly she uses England or Europe as background. She was also a well-known theatrical producer and many of her mysteries take place in the hot house, backstage atmosphere of the theater. She has a knack for 'getting' the grandiose theatrics of actors and their egos down pat. But it's not only her use of actors, it is her colorful characterizations of the variety of characters who inhabit her books that makes Marsh stand head and shoulders above a crowded field. In this she had few peers. Her creation of the suave detective chief inspector Roderick Alleyn was, I think, the precursor to the elegant English detectives who appeared in later books by different authors. He adds to the memorable quality of her books. When you think back on Marsh's books, you realize that they still resonate with Alleyn's presence long after you've finished reading them. You may forget the storylines but you never forget Alleyn. Though I enjoyed all of Ngaio Marsh's books, here's a short list (in no particular order) of my very favorites. And if you haven't had the good fortune to read Marsh, now's a good a time as any to start. They don't call her a Grande Dame of Mystery for nothing. Besides loving the title, I also like that this book is set in New Zealand during WWII when Alleyn is sent there on some hush-hush mission. 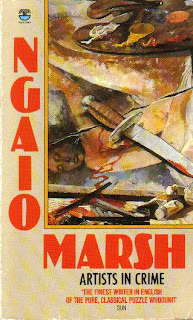 The murder itself is as inventive and gruesome as are most of Marsh's nasty bits of business - one of several reasons why she probably should not be thought of as a 'cozy' writer even though I'm sometimes guilty of doing just that. A particularly sad murder because the victim is a harmless, charming little fellow whom we come to know and like. Alleyn is incensed by this cruel crime and sets out to catch the killer while in an unusually grim state of mind. Seemingly every one's favorite Alleyn mystery. One of mine also. The murder is about as nasty a piece of business as has ever been devised. But it is in the brilliant characterization of the spendthrift and fecklessly charming Lamprey family that Ngaio Marsh's talent especially shines. filled with a motley assortment of young artists who've come together to paint and learn from the renowned Troy. Again, as in most Marsh books, the murder is ugly. Though Marsh's 'take' on the drug trade in Europe seems fanciful and probably incorrect, I love this book for the wonderful characterization of Alleyn and Troy's little son, Ricky. But then I am awfully fond of precocious British children. I like the closeness between the child and his parents - loving without being overly sentimental. And the fact that the murder is seen from the window of a train by no one less than Alleyn and his wife is an added plus. A spur-of-the-moment river barge cruise for artist Agatha Troy (Mrs. Roderick Alleyn) turns murderous. I love this sort of thing: a murderer hiding in plain sight on what is meant to be a pleasure cruise - an assortment of suspects conveniently at hand. Alleyn goes after a shipboard serial killer who scatters flowers on his victims. Not the usual sort of Marsh, if any of her more clever books could be said to be 'usual', but it is the only serial killer book in the bunch. Alleyn's son is a young man now and comes up against a nasty crowd while he's off on his own, quietly trying to write a book. Again the characterization of Ricky, now grown, is especially good. He is a fully created young adult, separate from his famous mother and father, though still able to call on them when in trouble. Murder at the Vulcan theater. Actors, producers, directors, stagehands, managers, publicists, hangers-on, egos run amok. A lovely place for a nasty murder and Marsh sure knows her stuff when it comes to backstage at the theater. There are many, many more Marsh books I could list, but these are enough, I think to get you started, if you care to start at all. I'm just glad I got the urge to read them which led to my discovery that some of them I hadn't read at all. That's the way it works sometimes. Hi Craig, thanks for posting. Oh you really do have to read Ngaio Marsh's SURFEIT OF LAMPREYS. It has a reputation for a reason: it's terrific.